Nestled in a narrow cobbled street in the heart of the old town lies Baudon de Mauny, a boutique bed and breakfast, offering a luxurious base from which to explore the city. The building is deceivingly simple from the exterior but push open the heavy wooden doors, climb the impressive stone staircase and enter the stylish haven that awaits. 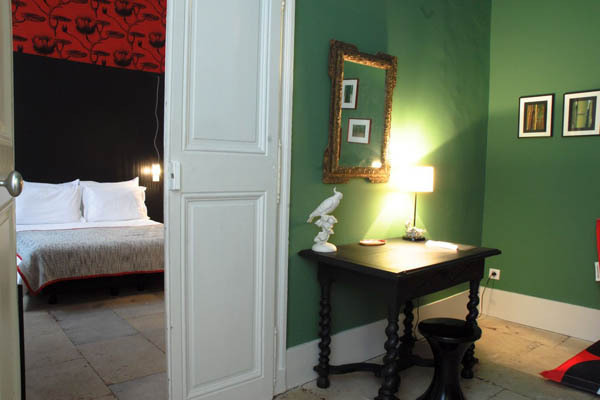 The bed and breakfast is house in a former hôtel particulier (a private mansion) dating from 1777 and has been in owner Alain de Bordas' family since 1829. In 2008 Alain and his wife Nathalie, an interior designer, transformed the property into an elegant chambres d’hôtes that seamlessly blends period features with modern design elements giving it a contemporary feel while celebrating the history of the building. Intricate cornicing, marble fireplaces and oil paintings of some of Alain's ancestors work in harmony with classic design pieces such as the Eames rocking chair and the dramatic printed Cole & Son wallpaper that adds detail to the largely white colour palette. With only eight bedrooms the bed and breakfast has an intimate feel to it and we opted for the spacious Poppy Suite. A delightful reading room, complete with oversized Marimekko floor cushions, welcomes you to the suite, which leads into the sumptuous bedroom and ensuite. The suites include use of a fully equipped kitchen giving you a genuine excuse to spend hours perusing the stalls of fresh produce at the market in Place de la Comédie. If cooking isn't your thing or if you just don't want to spend time in the kitchen while on holiday then Alain can recommend some of the many bistros, restaurants and bars that are within walking distance of Baudon de Mauny. Breakfast is served in the 14th century conservatory and the fruit salad, yoghurt and basket of bread and pastries fresh from the boulangerie are a simple yet delicious start to the day. And if you want somewhere to relax in the afternoon then the elegant lounge, with its enormous windows that light streams through, is ready and waiting to welcome you. Previously deputy editor on Living France magazine, Anna is now a freelance journalist and blogger based in Cheltenham in south-west England.